1.I am feeling better today. I have had a tricky week one way and another and I was feeling very low after receiving a bit of a shock. However I am now viewing it as a cathartic experience and am back to my usual bouncy self. 2. My Mum and Dad are visiting, which I always really enjoy. We are all very close, and I especially like the evenings where we have a game (Uno if we are very drunk, Bridge if we aren't!) and discussions about all sorts - from politics to the X Factor! 3. I have some really lovely friends (including some very new ones found through blogging). 4. My business is turning into a reality - and I have heaps of things to be excited about with it. 5. My children are (on the whole!) a delight, and are especially happy at the moment as their grandparents are visiting. I could go on, but I won't bore you any longer. Sometimes it is good to appreciate what we have, and I am really feeling the positives in life at the moment and thought I would share it with you. I hope it inspires you to think of some things that you are feeling happy about. Mum and I went to a Fashion and Gift fair at the racecourse yesterday, which was good fun. I didn't buy anything as it wasn't very inspiring, but it was nice to spend some time with my Mum and we had a good gossip on the way round. She can be very embarrassing - she has a tendency to look at something and say "You could make that" in quite a loud voice. Usually when we are looking at hand knitted stuff - and I can't knit. I don't know why - I can crochet, and it is in the family - my Grandma knitted her first jumper at the age of 5, and my Aunt can do very complicated Fair Isle stuff. Mum has tried on several occasions to teach me, but I think it is the patience thing. I like sewing as it is really quick and I can finish a project in one sitting. With knitting I will have to keep coming back to it, and I am not good at that. I started a crocheted blanket last Winter and I have done about 10 rows. I has been abandoned in my wool basket since then, and I really should persevere. Oh well, I'll add it to my list. 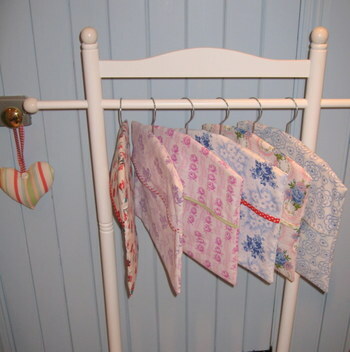 I have been busy sewing for the website and fairs again - here are some of the peg bags I made after finally plucking up courage to cut into my precious vintage fabrics. They are just waiting for bows around the hanger to finish them off. 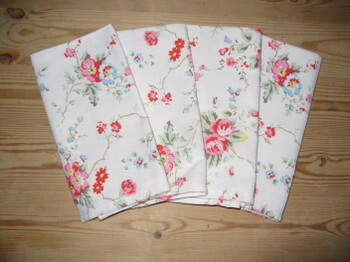 I have also made carrier bag holders in similar fabrics...they'll be on the website very soon. Well, as ever I will leave you with a gratuitous house shot or two. 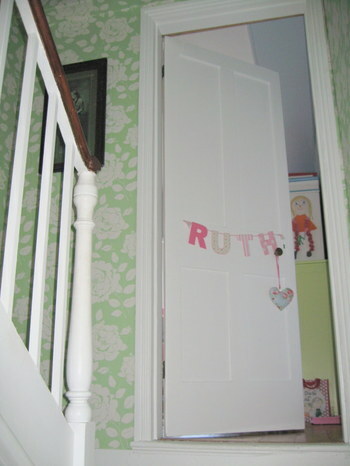 This is my hallway and was the most recent project in the house (this time last year!). I spent months thinking about what to do with it, and then happened across the Mono Rose Cath Kidston wallpaper in last year's catalogue. It was exactly what I was after, although it is still a scary decision to make as it is an expensive project to get wrong. It wasn't helped by the size of the sample that CK sent - about half a sheet of A4 paper. Still, I am so pleased with it and it has brought the rest of the house together as all the colours of the other rooms go really well with it. Hope you are all having a fab weekend wherever you are. Thank you all for your lovely comments again - they really have helped me to get back to my jolly old self. Morning all. Well, I am back in soft bottom mode again (see earlier post). Have been to doc about my chest and hope the pills kick in soon. 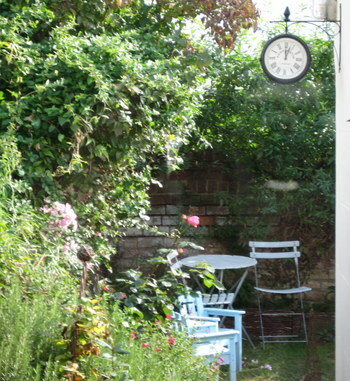 Still, all your lovely comments about my house and my website have cheered me up no end. I am very fortunate that one of my good friends has a husband who is an amazing web designer and he built the website for me. He also put up with quite a bit of indecision and dippyness from me, for which I am eternally grateful (thanks Matt!). Anyway, being ill has given me time at home that I wasn't banking on so I have managed to get quite a bit of sewing done and am going to put new stuff on my website very soon. 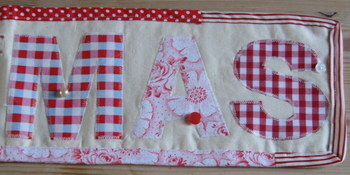 These are pics of my latest design (it says Merry Christmas but I couldn't fit it all on one photo!). I have also done a 'Happy Birthday' one in more pastely colours. I love choosing the buttons to go on each letter. It just needs a good iron and finishing with ribbon loops for hanging. I am also looking into setting up an Etsy shop. Has anyone done it? If so is it working for you? There seems to be so much stuff on there at the mo and I wonder how much gets sold. Still, every little helps, so I think I will investigate this further. Watch this space! Having sorted through my piles of fabrics I have got heaps of inspiration, and I have even decided to cut into some of my most favourite pieces of vintage fabric. I have had them for ages and I keep taking them out and looking at them, and I almost can't bear to make things to sell out of them, but there is a limit to how many things made from fabric a girl can fit in her house, and more sales means more fabric shopping!! 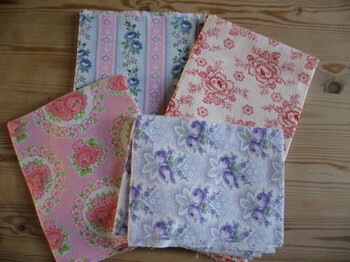 These are so pretty and I have heaps of different fabrics along these lines. A very kind lady sold me some on ebay a couple of years ago and I have since dealt privately with her so she sent me a huge bundle about a year ago. I have used little bits of some of them but I can't bear to use it all. Silly isn't it?! This piece I just love and I can't decide what to do with it. Any ideas? And this piece is quite big, and I have actually used some of it in projects but can't bear to part with all of it. It is brushed cotton and I was thinking about making PJs for Ruth out of it. Now I have my overlocker I am thinking about adding PJs and nighties to my website too, as I have been making them for the girls for a while. 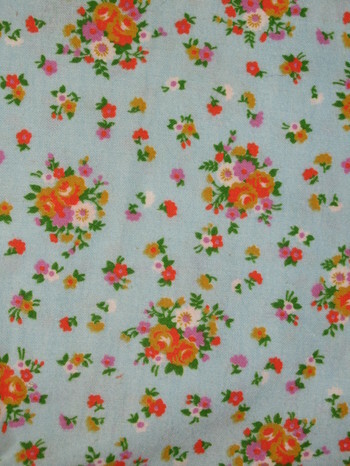 I find it really hard to find nice cotton ones which aren't extortionately priced. 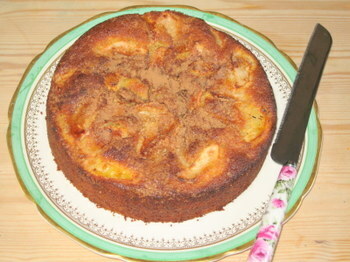 Momentarily forgetting the diet, I am feeling like cake is going to be the only way to inject some energy today, so I may head out to the kitchen to make a Norwegian Apple Cake. I found the recipe on Mia's blog (which is one of the most inspiring blogs I have found - go visit if you haven't already), and I have been meaning to make it for ages. Well, I am off to hoover up the coal that Bodie has just stolen and crunched all over the carpet. Hope you are all having a lovely week. The tray - for those of you who asked - was from Boots several years ago, and I also have the matching melamine plates and bowls which were used daily when the girls were small but are saved for camping now. I shall leave you with some gratuitous house shots. 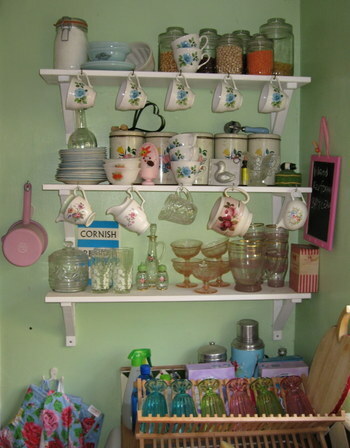 These shelves are the only bit of my kitchen that I like, so I won't show you the rest. Excuse the boxes of washing powder - I am having a wash-a-thon today! My garden is looking a bit sad at the moment but this is the view out of the dining room window. At least the roses are still thriving! ...a creased tablecloth and hot chocolate! We all have our own special hot chocolate mugs but Andy had coffee which wasn't so photogenic. I found a recipe for homemade marshmallows the other day which I may have to try. Has anyone done it? Is it easy? I have spent today feeling sorry for myself and coughing and spluttering everywhere. I'm not a very patient person (no, really!) and I get frustrated with illness very easily. I'm not ill very often fortunately, and it is only a cold, but it is about time it packed its bags. I was meant to be doing a school visit today (I am chair of governors at the girls' school), but I thought they may not appreciate me spreading my germs around and disrupting lessons with my hacking cough, so I stayed in and sorted out my fabric instead. Below are some photos of my studio. 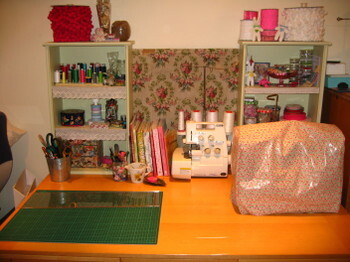 It was too messy to take photos of the other side of the room so I have kept it to my newly sorted fabric and desk. I found some treasures and am now inspired to get creating again. The blue thing on top of the shelf is a box I got for £1 at a car boot sale which holds all my beads and findings. It has loads of different compartments and is separated into colours. I love it because it is always organised and that is something that I am trying to emulate in the rest of my life. Without much luck. 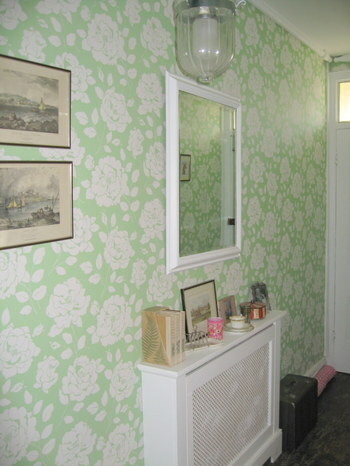 The board between the bookcases was dumped outside a house down the road and I fell in love with the wallpaper on it. It obviously came from the back of a wardrobe and was really tatty, but I have resisted everyone's efforts to get rid of it, and it fits perfectly between the shelves so I am glad I kept it. Sorry about the lighting - it is in the basement and has halogen spots. The window is the other side of the room, hence the light issues. 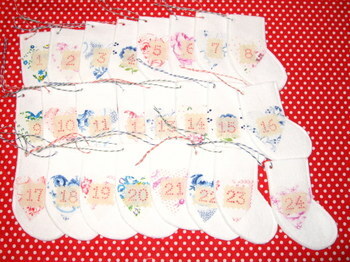 I finished my first (hopefully of many) advent calenders for the year, and also whipped up a batch of teacup candles. They may go on my website, or I may save them for my stall. I have a few things coming up so need some stock for those as well as the website. I can't believe I am making stuff for Christmas but it does feel good to be a bit more organised than last year when I was up until 1 every night making stuff at the last minute. I am not very good at getting heaps of stock behind me, and tend to replace it as I sell it, which is not the best way to approach it. I am also thinking about adding some thrifted vintage finds to my website and stalls this year to supplement the handmade stuff. Actually it is just an excuse to go shopping without being told off by Andy. We really do have heaps of stuff in this house, but I can't bear to let a bargain opportunity go to waste. At least if I am selling it too I can get away with it more often! I am really enjoying my foray into the world of business. I am really excited about my website and have had some lovely feedback from both friends and strangers. It is really daunting going into this properly. I have tinkered about for years doing the odd fair and selling to friends but I decided earlier this year to get a business loan and do it professionally. (Actually it was either that or get a proper job, so I went with the fun stuff rather than the boring stuff!). If you haven't already please check it out at www.pinkgreencreations.com and let me know what you think. Hope you've all had a good start to the week. I'm really enjoying reading all your blogs and am finding new ones every day. Please leave me a message if you haven't already so I can add you to my list - you can never have too many friends! Good morning Bloggers, and family! My family all seem to be using my blog as a way of catching up on my news, which is great, but I hope it doesn't mean the phone calls will stop! My cold has turned into a serious lingerer which meant yesterday was a bit of a write off. I spent the day pottering around the house in my soft bottoms (comfy trousers!) and decided to sort out Grace's bedroom. We have a constant battle about tidying up, but to be fair to Grace storage has been an issue which makes tidying difficult. I had the brain wave (?) 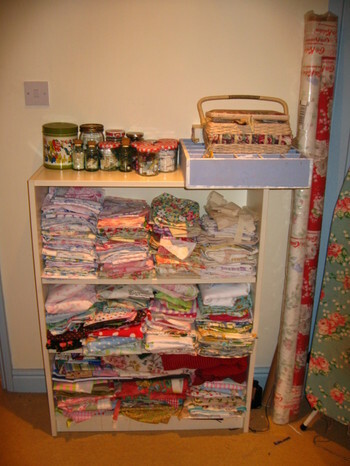 yesterday of using my fabric storage from my studio to put in her room, which did the trick but now means I have to sort out the fabric and find a new home for it. It's funny how these jobs just create new jobs isn't it?! Anyway, I didn't really achieve much else, Andy took the girls and Bodie out for a walk and that was the day. Today I am feeling much better so we are planning to all go out somewhere this afternoon, but I am making the most of a few minutes peace to do some blogging. 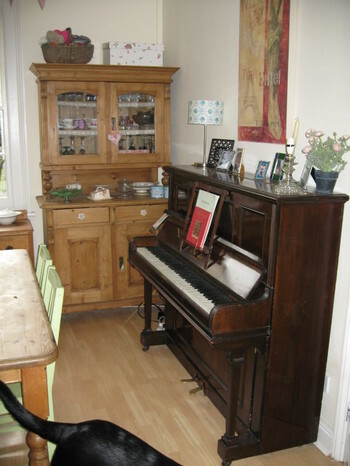 As I haven't achieved much I thought I'd show you a few bits of my house. My home has always been really important to me, and I used to while away hours moving the furniture around my bedroom and placing objects in different spots as a child, and that has just carried on in bigger form now I have a whole house to do it in! I love houses that evolve rather than ones which are done from the outset. I think you can always tell they are staged rather than lived in. It's just as well really as we have lived here for 6 years and are still working our way through it! This is my favourite corner of my living room, where I can sit and watch people go past the window and warm my feet by the fire. 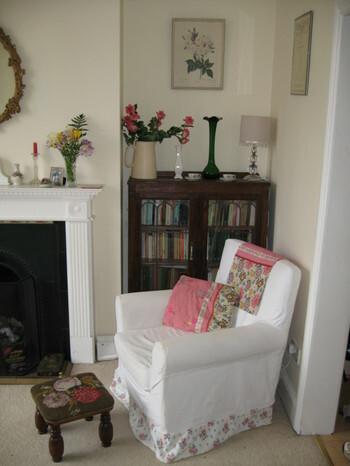 The footstool is my most favourite thing in the whole room and I got it from an amazing antiques place in Grantham last year. I doctored the Ikea chair with a table runner and matching cushion, and I unpicked the back of the table runner and made it into the frill around the bottom. The bookcase was a bargain from a local junk shop. Second only to my home in importance to me are my books (I should just point out here that both things come after my family, of course). I have always been a voracious reader and love everything about books except the cost! I love the smell, the feel and the look of the rows in bookcases. I have never understood why people only surround themselves with old books that never get read and hide away the ones they do - I think all books look great. Most of mine are in the dining room, but these are some of my favourites of all and live here where I can look at them from my chair! 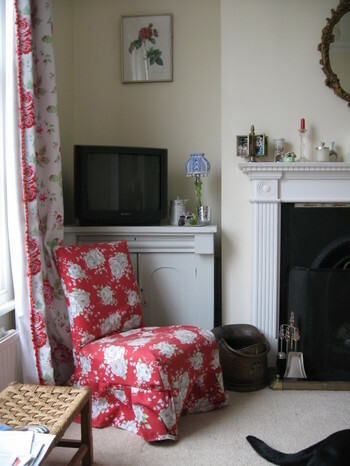 The blanket on the sofa was Andy's when he was a baby, and the bright checked one was a recent purchase from a local shop - perfect for snuggling under in the Winter. 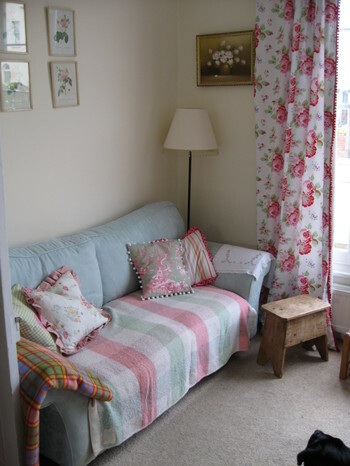 The curtains have been up for ages - it is Ikea fabric and was £2.50 a metre! I really wish they hadn't abandoned their shabby chic phase! Bits of Bodie seem to feature in every photo - I kept trying to move him but gave up in the end. He's worse than the children for nosiness! 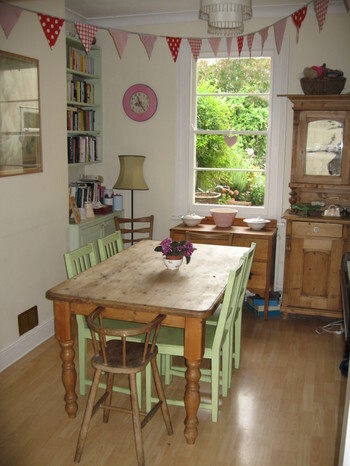 The dining room runs off the living room, and is where I am sitting as I am writing this. The bunting went up for Ruth's birthday in July and I haven't taken it down yet. I actually really like it up there so I may leave it for a while longer. The piano belonged to my Aunt (hi AJ!) who is an opera singer in Seattle. I am so glad to have it as it is a bit of family history, and one that we are all very proud of. And finally, a plea for help. 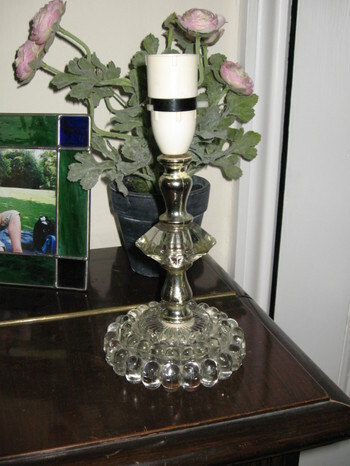 I bought this lamp base for £1 in a charity shop and it needs rewiring. Is that an easy job that I can do with parts from B&Q or do I need to get someone to do it? Andy is no use - if the answer isn't in the Guardian then he won't know! If anyone has any advice then I'd be really grateful. I hope you are all having a lovely weekend. Thank you to everyone who left me a comment - and if you haven't yet, please do. I love getting them and will try to respond to you asap. 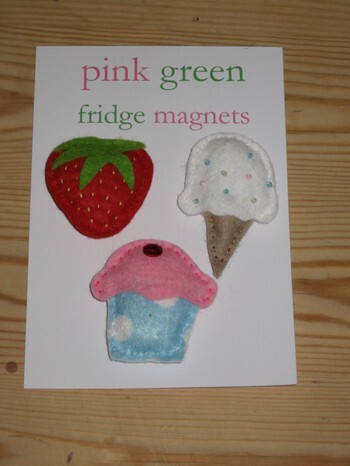 Thank you Sophie for mentioning me in your lovely blog - lots of people found me through you. Well, I am spending so much time checking out all your inspiring blogs that I am not getting much else done! There are so many talented people out there, and every time I read a blog I find a link to another one, and so it goes on. Grace came in to find me drinking a cup of tea and said "Not on your laptop, Mum?" in such a tone of surprise that I feel I may be neglecting everyone in favour of my new found entertainment. I did manage to complete some orders and also get some things made for my website though, so I'm not feeling quite as guilty as earlier. I love making these as I can do them in front of the TV. These will have matching face cloths by the end of tomorrow if I am not distracted by blogs again. I have a huge list of projects for the house to do but I am now trying to get some stock together for the fairs I have got lined up before Christmas. 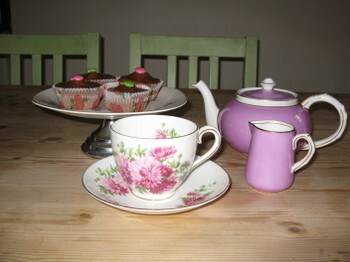 The girls both had friends round for tea tonight and I made chocolate fairy cakes in honour of having guests. 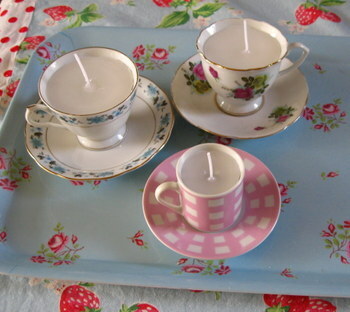 I did manage to steal a few quiet moments with a cuppa and a plate of cakes. I only ate one though, I promise. This is my favourite teapot and one which I use when I am having a leisurely cuppa, rather than the huge mug with a bag in it which is for every day use. It's been Lemsip for the past few days unfortunately though, which doesn't go quite as well with cakes. ...for £2 in a charity shop. 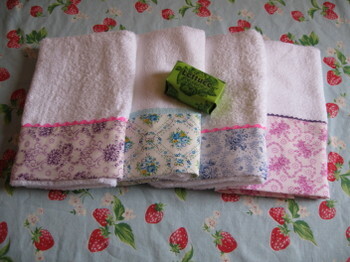 They are brand new and unwashed and are £15 in Cath Kidston. I only went in for the newest book for my book club (which I didn't get) and even took some of my own books in - I am starting a slow clear out, but you have to start somewhere. My theory is that the more I clear out the more space I have for new finds! 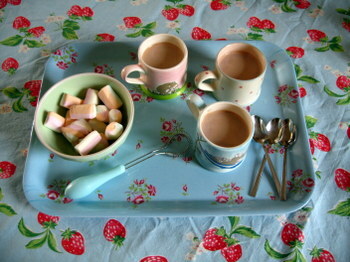 Good morning all my new blogging friends! Thank you for your comments. I was so excited getting them, and if I ever work out how to reply to them I will. Well, I hope you all had a nice weekend. We had the girls' best friends over for a sleepover on Saturday which was lovely - they are sisters the same age and are in the same classes as my two, which works out to be very handy. They weren't too late going to sleep but I didn't get much sleep as I always listen out for them just in case they wake up and are a bit lost! The older girls were up before 7am too, and I got up with them, so I was feeling a bit jaded yesterday! Some fresh air helped though, and we made the most of the weather by going to the Forest of Dean with Bodie for the afternoon. We took a picnic and then had a lovely walk. 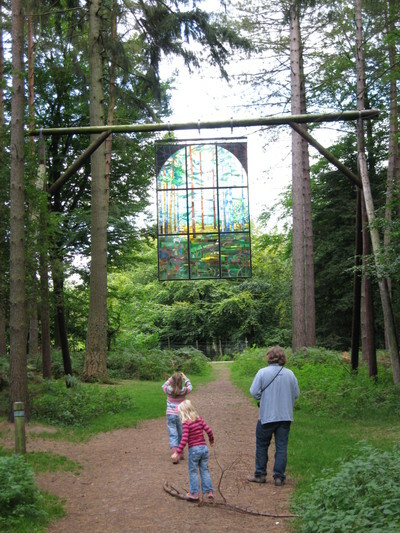 This stained glass window is part of the Sculpture Trail, and I love it. I think it really fits in well with the surroundings, but also stands out (if that makes any sense). We didn't do the whole trail as Bodie isn't up to it yet, only being a pup and he's not yet used to long walks. We got him as a sort of rescue dog and he hadn't had much in the way of walking or training. Both things we are working on! My lovely, lovely sister Rachel gave me these after I nagged her for days about how much more me than her they were! I think she only gave in to shut me up (so nagging does work, Andy!) but I am very grateful. So, onto today. I have packed the girls off to school (and we were the first in the playground - unheard of usually!) and I have been cleaning and tidying. A good friend called round unannounced recently and said as she came in, "Oooh, your house looks much more shabby than chic at the moment, doesn't it?!" Needless to say I was mortified (and it was true - it was a tip). I have cleared up substantially since then but I have decided that my plan is to tackle a room of the house each day and have a really good clean - skirting boards, the lot. Today was our bedroom. The theory is that our bedroom is a haven from the children - somewhere to relax and keep just for us. The amount of marbles under the bed, dolls clothes mixed in with the ironing and the pieces of jigsaw puzzle in my make up bag proves that theory isn't working. Anyway, order has been restored for now, and here's a pic to show you. It will also prove to Andy that it was tidy as by the time he gets home from work it will be covered in washing and toys again! Looking at this photo it has occurred to me that pretty much everything in it is a gift from a friend. 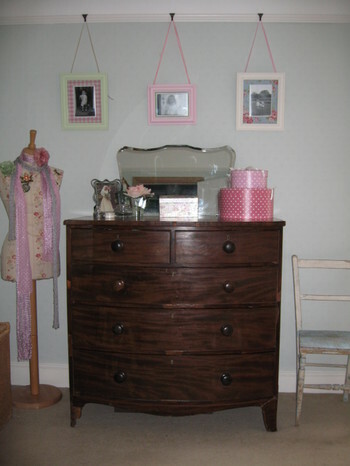 The tailor's dummy was a gift from my good friend Hannah that I covered in some fabric won on ebay and the chest of drawers from the lovely Clare. I am a lucky girl! This one's just for you, Vicki, from Hollyhocks - thanks for your comment! 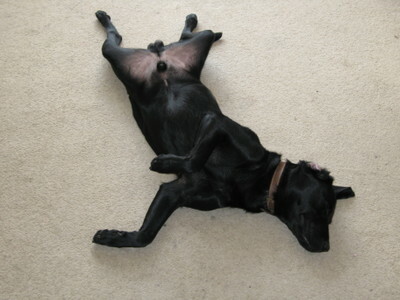 This is Bodie's current fave sleeping position. He has no shame. 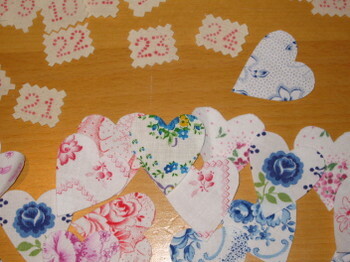 If anyone knows how to centre the photos on Typepad, please could you let me know? I have messed around for hours trying to get it right but to no avail. Well, I have orders to finish and stock to make for the website, so I am off to the depths again! Well, this is my second attempt, having already written a post and then forgot to save it. So here goes...my first post! I have been reading blogs for at least a couple of years, having stumbled across Belladia purely by chance. I decided I should stop just reading them all and join in the fun. So, a bit about me. I am 31, I live in a Victorian terrace in sunny Cheltenham Spa with my hubby Andy, beautiful daughters Grace (7) and Ruth (5), and my adorable 9 month old Black Lab, Bodie. I run my own craft business which has just become web based, and hence I thought I'd embrace modern technology all in one go with a blog as well! I love to sew and generally be crafty (! ), and have the luxury of a basement studio which I descend into the depths of with a cup of tea, only to resurface for more tea or when I remember to get the girls from school! I also help out at the school both as a volunteer classroom helper and also as a Governor (I am currently chair, which is scary but interesting). I have an allotment, which despite the terrible weather and tomato blight I still love, and it makes up for the small garden I have here. 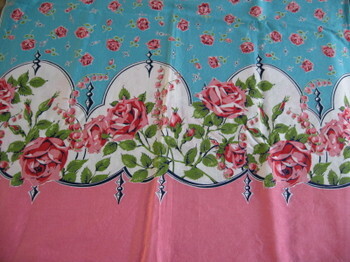 I have a thing for roses - my whole house is covered in them, from curtains to chairs, china to children (in fact anything beginning with C!). My long suffering hubby has thankfully decided to just let me get on with it, for which I am eternally grateful, and just heaves a huge sigh whenever anything new appears in the house. He is outnumbered though - we may just have got a male dog but it is still 3-2 to the girls! As I've started this blog on a bit of a whim I haven't taken any photos specifically for it, so you will have to make do of 2 of my handsome beast. Once I've tidied the house and cleared away the cobwebs I will let you into my house. Until then, here's one with a bit of my garden in the background! I promise this won't be a blog where I bore you to tears about my dog!